The Page 99 Test: Francesca Russello Ammon's "Bulldozer"
Francesca Russello Ammon is Assistant Professor of City & Regional Planning and Historic Preservation at the University of Pennsylvania. Bulldozer chronicles the widespread application of building demolition and land clearance in the postwar United States. A “culture of clearance”—that is, the ideology, technology, policy, and practice of large-scale destruction—underpinned this work, and it was powerfully rooted in the preceding experience of World War II. Page 99 discusses this postwar transition, focusing on the roles of mid-century housing policy and defense industries in fueling this national story. Federal legislation incentivized both the execution of clearance and the construction of housing that sometimes ensued. As page 99 reveals, the GI Bill of 1944 made homeownership more affordable. Through zero down-payment loans, coupled with low interest rates and long amortization periods, the bill enabled nearly four million World War II veterans to become homeowners. To make way for much of this housing, countless acres of farmland and forests fell. Earthmoving companies also leveled hillsides and moved massive amounts of dirt. These efforts helped create the large, flat, seemingly blank slates upon which suburban tract housing, shopping malls, and industrial and office sites were built. As elaborated elsewhere in the book, additional policies further propelled the rise of the postwar bulldozer. The Federal-Aid Highway Act of 1956 provided 90 percent federal subsidies for highway construction. It spurred the removal of large quantities of earth, rock, and physical infrastructure, while also facilitating the flight of residents and businesses to the suburbs. Meanwhile, in cities, Title I of the Housing Act of 1949 funded the bulldozing of buildings by covering two thirds of the cost of acquiring and clearing “slums” for urban redevelopment. The large-scale application of construction equipment during World War II helped pave the way for these postwar policies and practices. As page 99 further discusses, Southern California quite tangibly exemplified the transfer of wartime men, machines, and methods from battlefront to home front. It was the port of departure and return for the Naval Seabees (short for Construction Battalions), many of whom settled in the defense-fueled region upon their return. Through postwar employment with wrecking, earthmoving, and construction companies, some of these men were able to put their new and war-honed skills to use. But the reach of the postwar bulldozer was not limited to California alone. Landscapes across the county felt its influence. As thousands of buildings and acres of natural growth gave way to the bulldozer, the culture of clearance dramatically remade the postwar American landscape. 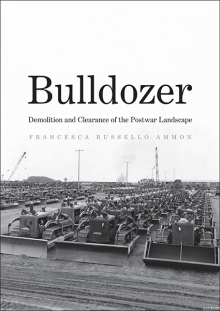 Learn more about Bulldozer at the Yale University Press website.